My paintings and fused glass are represented by HorseSpirit Arts Gallery in Ellicott City, Maryland since last January and I've signed my contract to continue in 2018. The Artistic Spirit video series by HorseSpirit Arts Gallery included me and my art in its second episode. People from across the globe participated in the Facebook LIVE session and it reached over 1800 views within one week. What magnificent press! I continue to have a Facebook and Instagram follower from Japan that is the result of this series. Enjoy the video on YouTube. I've inserted a link at the end of this post. I was accepted into three (3) international watermedia exhibits during February, resulting in Signature Artist status in all three. Signature Artist status is an honor many societies offer after you've been selected to be in their shows after a certain number of times. I now have Signature Artist status in six watermedia organizations. My artwork was featured in a solo exhibit in March at Touchstone Gallery in Washington DC. 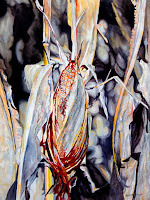 My first of several paintings was sold at HorseSpirit Arts Gallery in February with continued sales throughout the year. Thanks to Robin Holliday and her wonderful staff for all their hard work. 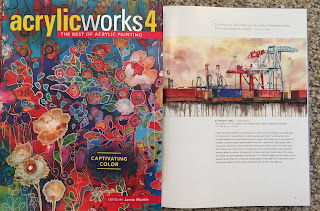 My painting, Freight Yard, was included in AcrylicWorks4: Captivating Color, a Northlight best of acrylic book, which was published in April. I had a wonderful trip to New Orleans, where my husband and I joined my brother and his girlfriend, for the French Quarter Fest. Lots of great music, fantastic food, and fun; not to mention lots of wonderful new source material for future paintings. In April I learned that my painting, Lunch with Champagne, was selected for North Light Books' Splash 19: Illusion of Light. I never thought I would have artwork selected for this Best of Watercolor book. It will be published in 2018. I taught a couple Fun with Fluid Acrylic workshops in 2017; first in June and again in October. I've been thinking about teaching and found out I really enjoy doing so, despite feeling like I carry half of my studio with me to these workshops. I did, however, learn how exhausting it is to teach. 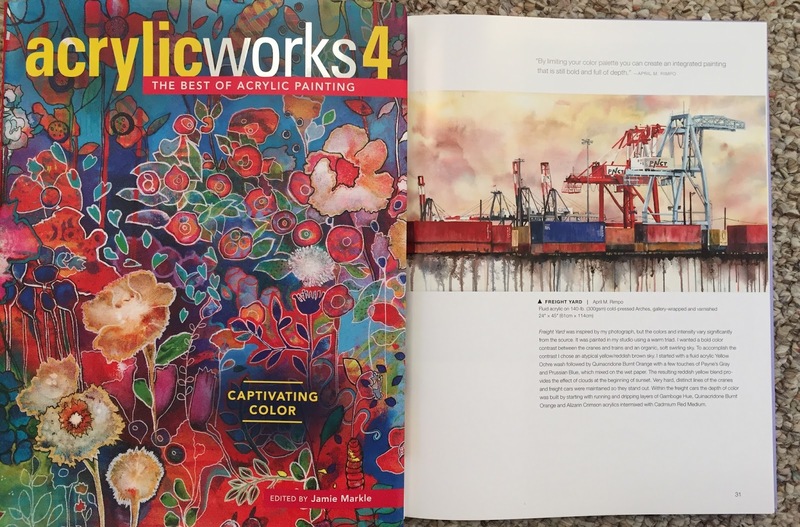 June brought me news that two of my paintings will be in North Light Books' 2018 Best of Acrylic book, AcrylicWorks5: Bold Values. The selected paintings are Movement and Lanterns. 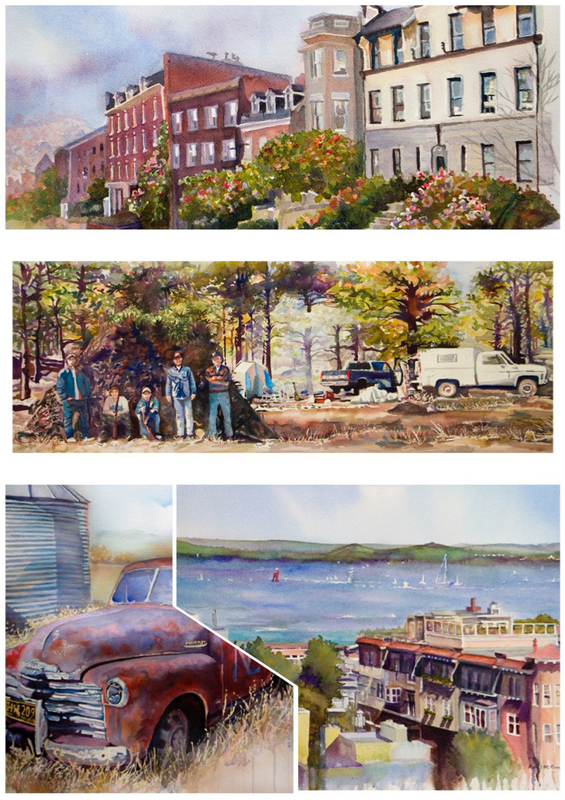 The Bakery was selected for the Pennsylvania Watercolor Society's 38th Annual International Juried Exhibition, held in Gettysburg, PA. It was so nice having a show that is only a little over an hour away, allowing me to see it in person and to attend the opening reception, where I received an Honorable Mention award. In November this same painting received the 3rd Place award in the Bauhaus Prairie Art Gallery Online Exhibit "Landscapes, Seascapes, and Interiors." In October and November Movement III was on exhibit in the International Society of Experimental Artists' 26th Annual ISEA International Art Exhibition, held on Sanibel Island, Florida. 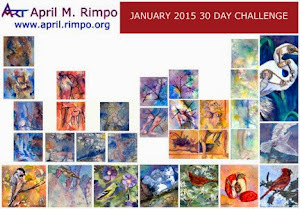 Movement III was also accepted in the International Society of Acrylic Painter's 2nd Online Member Juried Exhibition. 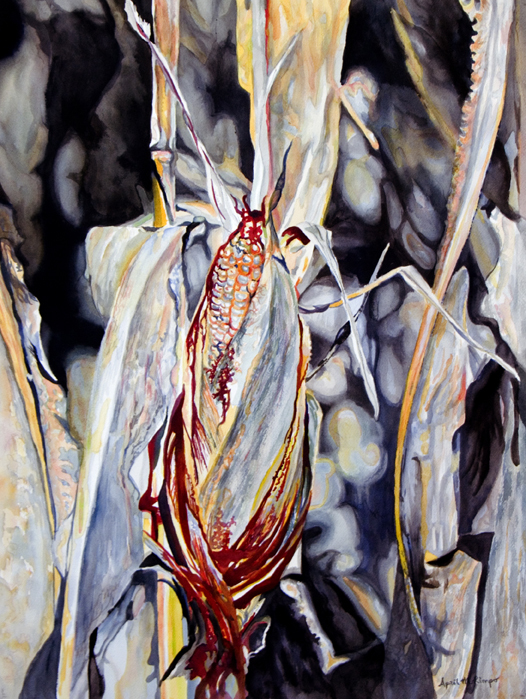 Stalks was selected by juror, Susan Behrends Frank, Ph.D., Curator, The Phillips Collection, Washington, DC for the Maryland Federation of Art Exhibition Strokes of Genius. I created my first video of me creating a painting. Since I started with my wet, drippy, netting technique, I had to tip my board a lot during the first part of the video in a way that you cannot see the whole process. I hope you see enough to understand the basic approach. 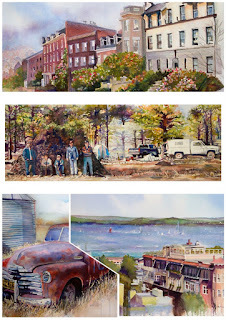 I've inserted some stills into the video to show the progress and included an image of the finished painting at the end. You can see the video in my blog on They're Everywhere. Three of my fused glass pieces sold this year; two being direct sales. 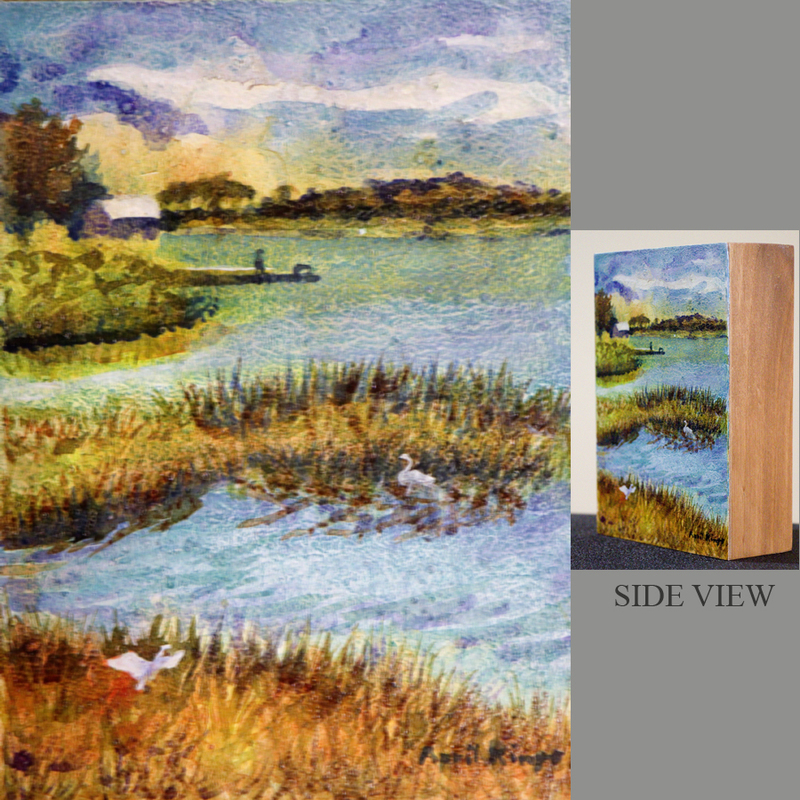 It was a big surprise for me since I have been focusing on my painting and not my fused glass. Perhaps there will be some new fused glass creations in 2018. 2017 was a wonderful year for my art and my personal life. I've just returned from a great visit with my son, his wife, and her parents. It is always a treat to have time with family. I wish you all a fantastic year in 2018 with great health and happiness! Although I no longer play an instrument, when I was in my early teens my brother and I were very interested in music; the Beatles probably had that impact on all teens in those days. He got a guitar and I won one on the boardwalk in Atlantic City when I was 12 years old. A few years later we played together with a few neighbor kids, until my brother was embarrassed to have his "little sister" tagging along with him. His interest in playing music has lasted and he now owns many guitars plus I think a banjo and mandolin; I am actually not sure about the full inventory of instruments he owns. My musical interests turned more to singing, which I did in a Madrigal Group and Chorus in high school. In my late twenties and early thirties, I played in a band with my husband. We performed with friends for fun, not professionally. When visiting an old mansion-turned-art-gallery, I saw a woman being interviewed about her music. Her instruments (the guitar, banjo, and violin case) were sitting in the hallway (giving me an opportunity to photograph them from a variety of angles.) She was using the violin during the interview. 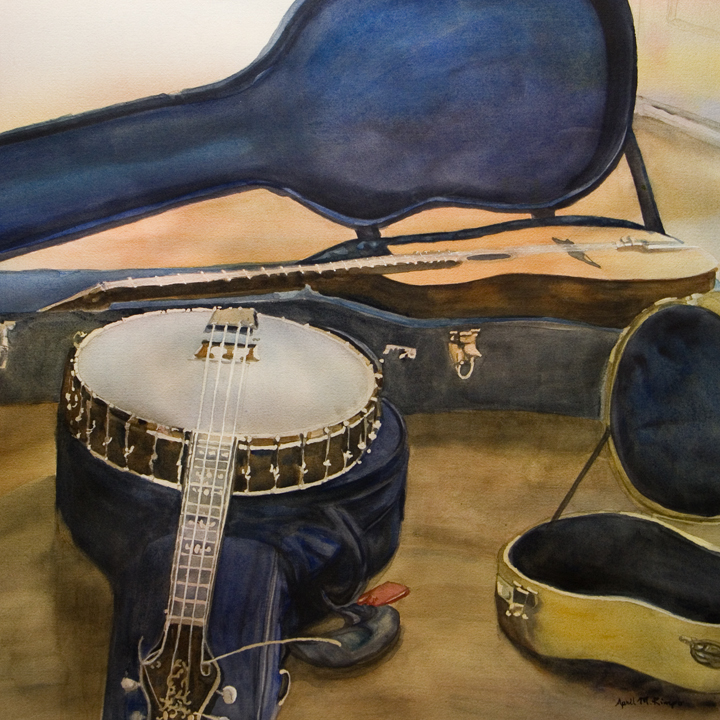 She and her instruments brought back great memories of being with my brother, playing, listening, and enjoying music in our early teens. Fiddle Away is my tribute to that woman and all the musicians around the world who bring joy with their talents. 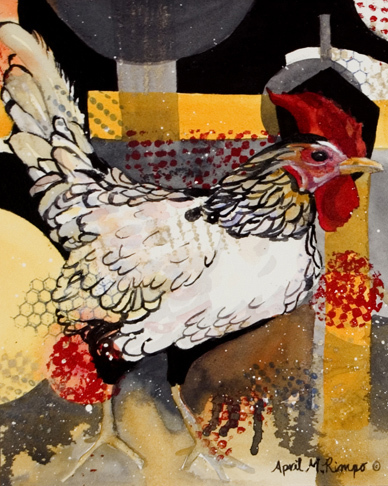 This year is Columbia Art Center's 20th Singular Sensations Holiday Art exhibition. 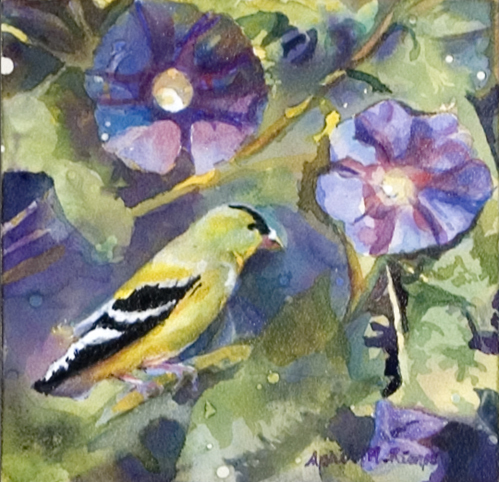 All work is priced at $200 or less, perfect for gift giving. Opening Reception on Dec 7th, 6 - 8 PM. The exhibit runs through Dec 14th. I selected three glass pieces and three paintings for the event. The paintings all have deep wood cradles that can sit on any surface and can be displayed stacked upon each other. They are perfect for small spot, on book shelves, end tables... You get the idea. Copyright April M Rimpo 2017 All Rights Reserved. You may share my work with attribution, but all other uses are prohibited.